It's been 2 years since I last posted about my asset allocation. I also wrote about my portfolio in 2014. Let's take a look again at how my dollars, my tiny green employees, are working for me. My investment principles are keeping things simple, low cost, automatic, and diversified. I achieve this by buying and holding index funds offered through the Thrift Savings Plan and Vanguard. I also have a regular Betterment account I opened to understand robo-advisors and compare the cost and performance to a self managed account. My focus is on what I can control in investing: costs, savings rate, and diversification. My favorite investments are low maintenance investments that don't require any input from me. Dividends get reinvested automatically and I just keep contributing money every paycheck. I have enough hobbies, activities, and work to occupy my free time. I don't enjoy reading financial statements, picking stocks, or managing and maintaining real estate. I only look at my accounts once a month with Personal Capital when I update my net worth spreadsheet. Beating the market is extremely hard to achieve even for professional stock pickers, so why bother? I have better things to do with my time. See Jack Bogle's The Little Book of Common Sense Investing for more on this topic. With those thoughts on my investing philosophy, here's my 2018 asset allocation. In 2018 my money is invested the same as in 2016: 95% in stocks and 5% in bonds. Within this overall asset allocation, I hold 75% of my investments in US stocks through in the Vanguard VTSAX (ETF: VTI) Fund, TSP C Fund (S&P 500 equivalent, the largest 500 companies in America), and S Fund (all other US stocks outside the S&P 500). Since the C + S Fund = VTSAX, I hold 4x as much C Fund as the S Fund because the C Fund's market capitalization is 4x as large as the S Fund. This is weighting my portfolio by market capitalization. 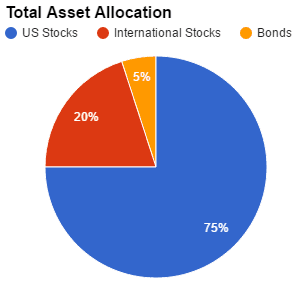 International stocks make up 20% of my portfolio, all held in the VTIAX (ETF: VXUS) Fund at Vanguard. I've moved away from the TSP I Fund due to it not completely representing the total international stock market. It's a small and probably negligible difference, but VTIAX contains more countries and more companies than the I fund. My bonds are held 2.5% in government bonds through the G Fund and 2.5% investment grade corporate bonds through the F Fund. Through my index funds, I own a small piece of nearly 10,000 publicly traded companies. I own shares in over 40 countries around the world. This is a tremendous amount of diversification and helps me sleep easy at night. I never have to worry about a single company or even country going bankrupt. There's no Enron or Bernie Madoff risk in my portfolio. My average annual fees across all my accounts are 0.06% on average, meaning I only pay $60 per year for every $100,000 I have invested. Check out the fee analysis performed by Personal Capital below. Because I opted into the BRS, I have to spread my TSP contributions over the whole year. The 5% BRS match can be worth thousands every year, but only if you contribute at least 5% of your pay every month, because the match is paid monthly. If you max out your TSP account before Dec 31 in any year, you could miss out on hundreds or thousands of dollars in matching. I made a few charts on the value of the BRS TSP contribution match so you can see exactly how much extra the government will put into your account. Also, I calculated the percentage of your pay you should contribute every month so you can max the TSP by the end of the year but still receive the 5% match every month. For my wife's and my Roth IRA accounts, I am manually contributing and trying to max out the accounts as early in the year as possible. After those accounts are maxed out I will continue investing a percentage of each paycheck into our taxable brokerage accounts at Vanguard or Betterment. Even though I plan on being financially independent by age 40, I still plan on working after that age. If I could find a well paid job without long hours, I would be happy to work that. The tax advantages to retirement accounts outweigh the pain of gaining access to the money in the accounts. There are many ways to access money in retirement accounts before age 59 1/2. See Mad Fientist and White Coat Investor for more details. Especially when you have income from a Combat Zone Tax Exclusion (CZTE) area, you need to stuff your Roth TSP and Roth IRA accounts as much as possible. This pay goes in untaxed, grows untaxed, and distributes untaxed. You can always access Roth IRA contributions untaxed and penalty free. Do not hesitate to contribute to your Roth IRA if you are in a CZTE area. I am prioritizing contributing to my retirement accounts and then my regular brokerage account. Based on 2018 values, that will be $18,500 into my Roth TSP, $11,000 in my wife's and my Roth IRA, and the remainder of my savings for the year into my brokerage accounts. Most military members have very low taxed income since much of the military paycheck is untaxed. Anything that is an allowance such as BAH, BAS, COLA is not subject to federal income tax. When you deploy to a CZTE, all of your pay such as base pay and other special pay is not subject to federal income tax. This is the time to prioritize Roth contributions. Roth or Traditional contributions depend on your family income situation. If your spouse is making a lot of taxable income, you may want to reduce your tax burden today with Traditional accounts. Otherwise, you should probably prioritize Roth contributions. My taxable pay was so low in 2017 and 2018, thanks to being stationed in a CZTE area, that I converted my Traditional IRAs to Roth IRAs and paid the tax on the conversion. A good strategy for highly paid military members is to contribute to a Traditional IRA if you are not deployed. Then, convert some or all of the account to a Roth IRA when you have a low tax year thanks to CZTE. Vanguard recommends annual rebalancing or rebalancing if your allocations get more than 5% outside your goal allocation. They have a paper here if you want more info. I prefer rebalancing annually. I have not yet had to rebalance when the accounts get 5% outside my parameters, since I am contributing monthly and each contribution is essentially a small rebalance. When I manually contribute to my Roth IRA accounts, I will check to see if my asset allocation is out of whack. If VTIAX grew a bit faster than VTSAX, I will contribute to VTSAX to get back to the allocation I want. *Are they actually better than mine? No, just different. The problem with selecting an asset allocation is we don't know what sector is going to outperform in the next period. You can back test the data (with a site like Portfolio Visualizer) all you want, but past performance is no guarantee of future results. I believe it is best to own many asset classes that you expect reasonable returns from rather than betting the farm on one particular sector or idea. Here's a “periodic table” of 8 major asset classes and how they have performed over the last 20 years. Notice how what's hot for a few years, like Emerging Markets in 2007, drops by over 50% in 2008. And every sector was down in 2008 expect for bonds. Just something to think about when constructing your own asset allocation. How are you investing in 2018? How much longer do you think the bull market can run? Does the market and economy seem like it's overheating to you? How do you feel about Target Retirement Funds? 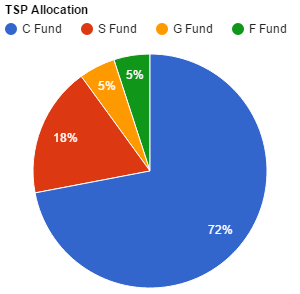 I have been using the TSP 2050 fund as well as the USAA Target 2050 fund for many years now because I didn’t know any better; from my understanding, the ratios of stock/bond etc for the Target Retirement Funds should be similar to your allocation percentages and then scale more conservative over the years. I am not very happy with my returns on these retirement accounts, however, so should I switch mine to start manually selecting the fund ratios? Should I rebalance (interfund transfer) the funds already allocated in the 2050 fund to the new ratios? Also completely off topic question, I would like to use Personal Capital for an overview of my net worth, but am a little concerned with giving all of my bank data to a free service- do you feel concerned at all with your data being compromised? Hey Dakota. I am a big fan of target date retirement funds, especially when someone doesn’t have the time, interest, or ability to construct their own portfolio. Why are you unhappy with the returns? What ratios would you select if you were to manually build your own portfolio? What new ratios are you thinking? How did you come up with these new ratios? These are questions for you to consider. Don’t make the assumption that you will outperform the target date funds with a manually built portfolio. I personally do not use the target date funds because I want a more stock heavy and aggressive portfolio. I don’t mind the big swings up and down because I have a very long investment strategy and I understand the market can be down for years because heading back up. Thanks for the quick reply. I am mainly unhappy with the USAA 2050 returns and expense ratios when compared to Vanguard’s 2050 returns and expense ratios; not to mention manually selecting funds with Vanguard similar to what you have shown here (VTSAX, VTBSX, etc) would be more diversified and has historically gotten better returns on average. I would still have the same ratios of stocks/bonds (90/10) that the USAA 2050 or Vanguard 2050 would have, but I would be able to select the funds instead of having them invested automatically. Thanks for your recommendation on Personal Capital- I may give it a try. Also thanks for doing these blogs as there is a large number of military folks out there that have this specific situation. @Dakota – Yes, USAA 2050 fund is .83% expense ratio vs. Vanguard 2055 Retirement Fund (VFFVX) of .15%. Over $100,000 difference by switching to Vanguard. I recommend you do it quickly. You outlined your bonds within TSP, what is your S and C fund breakout percentage each? As someone who is about to contribute to a TSP as a new government civilian (once the CR passes or a real FY budget is had) , I fully agree on your past and current allocation. Oddly enough I have a great and straight forward financial advisor whose done great for me, but he understands that when I move to the civilian role I’m moving half, if not, more of my IRA’s from him to the TSP. Those expense fees CANNOT be touched. 72% C Fund, 18% S fund. A simple 4:1 ratio to mimic the market capitalization weighting of the US stock market. S&P500 stocks are worth 4x as much as the rest of the US market. Mutual funds make more sense to me than ETFs. Expense ratios are the same but I don’t have to mess around with market orders vs limit orders with VTSAX. I just put in my order and it executes after the trading day. Gets back to my personal investing priciples of simplicity, low cost, automating, and diversification. Spencer have you read this? I’d never heard anything about getting taxed on earnings from CZTE Roth TSP but what he’s saying in the last paragraph in the post that sounds concerning. I’d always thought it was like you described but at least so far I can’t find anything on the TSP website that clarifies. Also, for taxable brokerage accounts, which would you recommend for a newer investor that’s just starting to max TSP and IRA? I know you said you started with Betterment as an experiment and also have Vanguard. If you had it to start again would you side with Mad Fientist and say the rebalancing and Tax Loss Harvesting that Betterment offers offsets the higher fees? Or just go Vanguard and do it manually? I’m kind of leaning toward Betterment after reading MF’s post but could easily be swayed haha. I think White Coat Investor has bad, out of date information in that post. I’m following up with him. Roth contributions from CZTE pay should go in untaxed and contributions and earnings should withdraw untaxed, provided you meet the IRS rules on tax-free Roth withdrawals. For withdrawal from the TSP I am planning on just letting it sit there until I can access penalty free at age 59.5. I’m not planning on fully retiring at age 40, just being financially independent to give myself options. If I did need/want to access the funds earlier, rolling over to a Vanguard IRA and then ladder/convert would probably be the way to go. For taxable brokerage accounts, after maxing your TSP/IRA it’s a toss up for me between Betterment or Vanguard Target Date fund or manual VTSAX/VTIAX Total US/Total Int’l stock market funds or similar. If you like the additional control of manually picking your asset allocation, go the Vanguard route. If you can’t be bothered, go Betterment. My brother is an accountant but has no time/energy for investing. He loves the simplicity of Betterment. I recommend Betterment to all of my siblings and cousins who want to invest but don’t want to make it complicated or don’t have enough funds to open a Vanguard account. Personally, I am happy with Vanguard’s low fees and will continue to allocate most of my taxable investments there.